Last night was one of those rare nights when I did not fall asleep two seconds after turning out the light. Instead of picking up a book or flipping through a magazine, I chose Facebook. Probably not the most calming thing to do, that sneak-peek into others’ lives, which inspires a host of feelings from surprise to jealousy to nostalgia to inspiration to you-name-it. As I spent longer than usual on Facebook last night, scrolling through my home page and my own timeline, I contemplated yet again this concept of holding on…and letting go. As I saw pictures of the church “young adults” group, church weddings, and barbecues and road trips with the church people, part of me just wished to go back to those times and to have life more mapped out for me, Christian-style…for the most part, though, I am excited to have moved on and wandered into more unknowns. It wasn’t until a couple years ago that I realized that it’s okay to stop trying so darn hard to make things work. I used to think that a person had to hold onto a relationship or a belief system, no matter what. I used to think that a person always had to turn the other cheek, go the extra mile, forgive just one more time, keep trying to make it work. I now see that as unhealthy and, well, not really “normal.” That skill of holding on and letting go — that’s part of life. I’m sure that, in some way, each of us tends to grip tightly, possessively, to certain parts of our lives — plans, traits, memories, a certain thing that is special to us. And there certainly are parts that we should hold onto. But I think, too, that sometimes it is important for our own well-being to loosen that grip. I know that in my own little world, I’ve had to loosen my grip on the familiar, the need for “everyone’s” approval, a friendship that wasn’t reciprocal or couldn’t weather the storms of life. I’ve learned that it can be so tough to let go…but it’s also important to see the reality of a situation, to remember the bigness of the world. It’s important to recognize our doubts, to ask tough questions, to be true to ourselves. 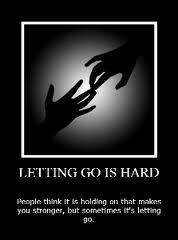 At times, it means we have to let go of something. It’s okay to stop trying so darn hard to make things work.For me, it’s still a bit difficult sometimes to be reminded that in September, but I won’t be going to the annual baptism service out at Wood Lake. In October, I probably won’t be going to the church Thanksgiving potluck. There’ll be no First Advent service and carolling in December. I most likely won’t be picking up my worship music again. Those familiar Bible verses don’t hold that special meaning for me anymore. I try not to let it bother me, but sometimes I get caught up in the sadness of it all. And then, and then… I remind myself to close that book (or log out of Facebook…). I look at my bulletin board and see the photos of church and non-church friends who make me laugh, who calm my fears, who cook the most amazing meatballs for dinner and then insist I take home the leftovers. I open my flip phone to text messages from a wonderful non-religious man who makes me smile and relax and act super-silly. I glance through my calendar and see that there are people, places, things…all outside of the comfortable little box of my former religious faith…and that is a good thing! I see myself as someone who is free from unhealthy belief systems, unafraid of the big “bad” world out there, curious and open to possibilities. A thought that occasionally runs through my head is, “What was that all about? Was it all worth it?” Yes, it was worth it — at that time, at that place, at that stage in my life, I saw religion as a necessary part of my being. Christianity gave me direction, a good community, routine, fulfillment, comfort, and many other important things. So, why would I not hold onto it? Until much it of it began to fall apart, I wanted and needed to grip firmly onto that faith.